Based on long lasting experience in endotoxin and pyrogen testing, Microcoat offers a set of proprietary methods and skilled scientific personnel for non-routine projects. Services are run as flexible customer-specified projects including the search for root causes, exploration of realization alternatives, development of product-specific adaptions and validation of newly established methods. We support customers in the selection and establishment of testing strategies for challenging samples and biopharmaceuticals in line with regulatory guidelines. LER (low endotoxin recovery) was first reported in 2013 (Chen et al. 2013) and describes the observation that endotoxin is underestimated due to masking in various drug product formulations with time. Reports exist where spiked endotoxin in drug formulations was not detectable by LAL but were pyrogenic in rabbit pyrogen test. Typical formulations comprise a protein component, polysorbate, citrate or phosphate. The effect is strongly dependend on storage temperature, duration of storage, nature of the API and source of spiked endotoxin. A LER hold-time study performed in our lab includes a detailed project plan and report. The experimental setup will be aligned with your specific needs. The turnaround time depends on the duration of the experimental phase but we guaranty short processing time for preparation of the study and generation of the report (in general 4 weeks). Microcoat offers projects to determine the masking potential of customer's drug formulations. Studies are individually designed based on the nature of the formulation, customer’s manufacturing processes and storage conditions. Looking back of 4 years of hold-time study experience we are experts in planning and performing LER studies. Our trained staff has the scientific background and routine. The studies will be performed according to FDA understanding and in line with cGMP standards. As reported by the FDA, classical endotoxin test methods (LAL) can fail to detect masked endotoxin in various drug formulations (low endotoxin recovery). In 2013 Hyglos GmbH launched a sample preparation kit for the demasking of endotoxin in biopharmaceuticals, EndoRS(1). 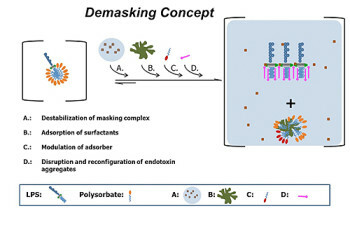 The new method is based on the combinatorial use of the kit components for the screening for the best demasking mixture. The kit has to be applied in combination with EndoLISA detection method. 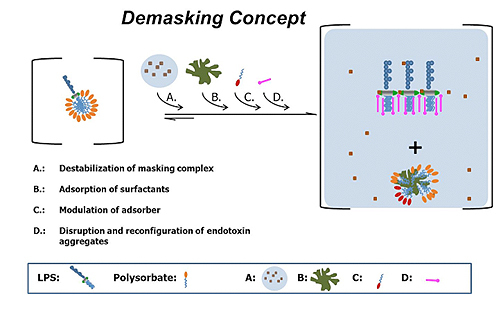 To proof the general applicability of the demasking approach for given drug formulations. We have the expertise and infrastructure to process projects reliably and fast. EndoLISA is routinely running in our detection service for several years. Endotoxin and pyrogen testing is mandatory during process development, as in-process control and for product release in pharmaceutical and medical device industry. In research (cell culture experiments and animal trails) contaminating endotoxins and other pyrogenic substances induce severe physiological reactions which often lead to false interpretation. The Limulus Amebocyte Lysate (LAL) based test is the gold standard for endotoxin detection. Various test formats are available. However, it is well established that this homogenous assay is influenced non-specifically by various substance classes and is specifically activated by ß-glucans via the Factor G cascade. 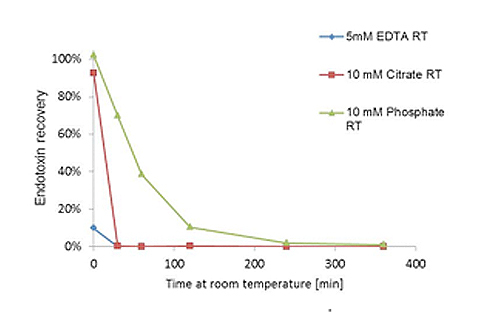 Therefore often more than one assay is required to prove the presence of endotoxin or other pyrogenic activators. Product specific validation of alternative methods according to Ph. Eur. The kinetic LAL reagent is based on a cell lysate generated from the blood of the horseshoe crab, Limulus polyphemus. The lysate is containing a blood clotting enzyme cascade which is specifically activated by the interaction of endotoxin with Factor C. The activated Factor C activates Factor B and Factor B activates proclotting enzyme. The activated proclotting enzyme releases a dye from a chromogenic peptide substrate. Proclotting enzyme is also activated by ß-Glucan via the specific receptor Factor G. If not differently requested, the kinetic chromogenic LAL assay (Endochrome-K™) from Charles River is used for analysis. Homogeneous in vitro assay. The assay reagent is containing a recombinant Factor C from horseshoe crab which becomes specifically activated by endotoxin. Activated Factor C is converting a peptide substrate and thereby releasing a fluorescent dye. If not differently requested, the recombinant Factor C assay (EndoZyme®) from Hyglos GmbH is used for analysis. Often extended dilution required due to high level of interference with matrix components. Therefore loss of sensitivity. Alternative method according to European Pharmacopoeia, chapter 5.1.10 and FDA (Guidance for Industry 06/2012). Specific endotoxin test based on ELISA principle. Endotoxin is bound to a microwell plate by a LPS-specific phage protein. After washing off the sample matrix, bound LPS is detected using a recombinant Factor C and a chromogenic peptide substrate. EndoLISA® from Hyglos GmbH is used for analysis. Low interference due to solid phase-based assay principle. Suitable for complex samples. One order of magnitude less sensitive compared to LAL and recombinant Factor C assay. The Monocyte acitivation test (MAT) is a cell-based assay: Toll-like receptor mediated stimulation of blood monocytes to produce pro-inflammatory cytokines in response to various pyrogens. The level of released interleukin-1ß is determined by a classical IL-1ß ELISA. The monocyte activation test from Merck-Millipore (PyroDetect System) is used for analysis. No differentiation between various pyrogens possible. Different pyrogens have different potencies. We offer quality assurance to laboratories working with Monocyte Activation Test (MAT). Based on our expertise we provide frequently audits of MAT test proficiency. Our Proficiency Test Program (PTP) confidentially verifies working procedures, method and report validation, identifies trends and potential demands for training. This supplies additional value to internal quality assurance. We audit involved analysts and confidentially compare MAT results to those of other laboratories in order to verify test accuracy. This enables laboratories to evaluate and subsequently improve MAT procedures and methods. The program is targeted at all MAT users that seek to verify working procedures via external audit without restriction of methodology, reagents, or instrumentation. Participating analysts will receive a blind, contaminated sample. Methodology, source, and readout are chosen freely by respective laboratories. Process and results will be examined for accuracy in accordance with European Pharmacopoeia (EP) regulations. All participating laboratories will receive a confidential report for comparisons among peers, while ensuring anonymity. Microcoat will provide a template for data transfer. Upon audit completion, we will provide a final report of all results for individual analysis. With Microcoat PTP for MAT, laboratories can increase their MAT-expertise and ensure full MAT-compliance. This assay uses a specially treated limulus amebocyte lysate (LAL) where the Factor C stimulation pathway is inhibited. Therefore only activation by ß-glucan via Factor G leads to activation of proclotting enzyme and conversion of the chromogenic substrate. The ß-glucan assay from Associates of Cape Cod (Glucatell®) is used for analysis. Extended dilution required due to high level of interference with matrix components. Therefore loss of sensitivity. Microcoat provides consulting service in the field of pyrogen and bacterial endotoxin testing. Our team is specialized in the implementation of alternative test methods and provides advice in the case of test interference. For the analysis of the Low Endotoxin Recovery (LER) phenomenon, we provide dedicated guidance in planning, performing and interpreting of hold-time studies. Always giving you advice and quick support if you are facing unexpected trouble during execution of your studies. Furthermore, we support you in the development of strategies for mitigation of LER-affected products according to regulatory requirements.